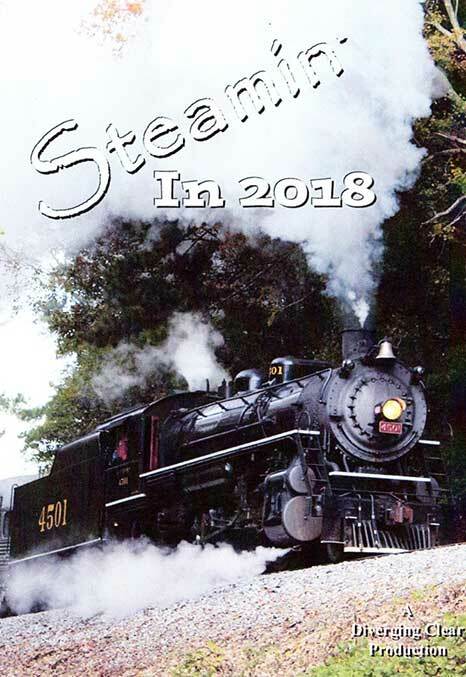 Once again we took to the road in 2018 in search of operating steam. 2018 marked the 9th year of operation for Southern Railway 2-8-01,401 at the Monticello Railway Museum in Monticello, Illinois. In May, Southern Rail Productions chartered #401 and a period mixed train for a day long photo train. 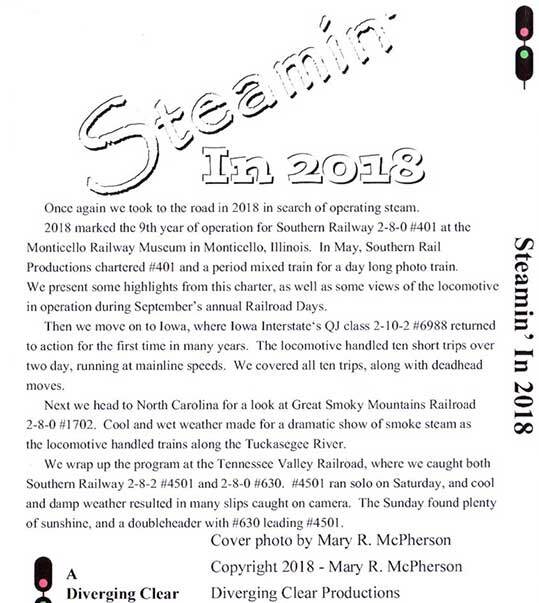 We present some highlights from this charter, as well as some views of the locomotive in operation during September's annual Railroad Days. Then we move on to Iowa, where Iowa Interstate's QJ class 2-10.2 #6988 returned to action for the first time in many years. T. locomotive handled ten short trips over two day, running at mainline speeds. We covered all tcn trips, along with deadhead moves. Next we head to North Carolina for a look at Great Smoky Mountains Railroad 2-8-0 #I702. Cool and wet weather made for a dramatic show of smoke steam as the locomotive handled trains along thc Tuckasegee River. We wrap up the program at the Tennessee Valley Railroad, where we caught both Southern Railway 2.8-2 .501 and 2-8-0 #630. #450I ran solo on Saturday, and cool and damp weather mulled in many slips caught on camera. The Sunday found plenty of sunshine, and a doubleheader with #630 leading #450I.